Why buy an off-the-shelf channel strip when you can build your own. LVC-Audio is billing T-Chain as a channel strip plugin "like no other". It's completely modular, so you can have just an EQ or compressor, for example, or create a complex chain of plugins by dragging and dropping. 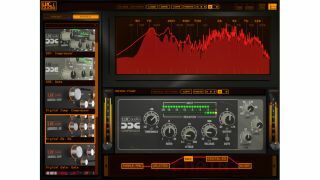 Several free modules are included, including an EQ, compressor, gate and splitter. You can then buy more modules as and when you need them. Several are available at launch, with more to come. As well as being able to create your own signal path, you can also configure T-Chain's interface, which is standardised whatever module you're using. There are four different layout options, as well as a waveform view and spectrum analyser. Find out more on the LVC-Audio website. T-Chain can be downloaded for free for PC and Mac in VST/AU/AAX formats, while modules are available from around $10 and upwards.